After visiting a local all day conference last week I realized quite quickly that I need to have a more robust solution for supplemental power for my devices. While I am generally happy to camp near an outlet for additional power for a notebook, hanging out and charging my phone or tablet strikes me as odd. My better half already uses the Mophie Juice Pack Air for an extra boost on those long flights, in my case I was using my phone as Wi-fi hotspot most of the day, and so my battery took a real beating. To be better prepared for my next conference (whenever that happens to be) I wanted a better solution for all my devices. At present I am road testing the GMP10K Ultra Capacity Mobile Power Station. The GMP10K has an advertised capacity of 11,000 mAh (I will explain what this means shortly), and considering the device is only 0.65 lbs this appears to be a winner out the gate. Is THE GMP10K right for you? First you need to check the storage capacity of your personal devices which then leads directly to what you will require from a battery pack. For example I currently own a Lumia 928 which, according to the specifications, has a battery 2000 mAh. Milliamp Hours (mAh) is a unit for measuring electric power over time and is used to describe the total amount of energy a battery can store. So given the 11,000 mAh capacity of the GMP10K, and the 2000 mAh battery storage for Lumia I could probably recharge my smart phone 5.5 times (in theory, some energy loss is expected during charging). Similarly our iPhone 5 has 1450 mAh battery capacity and could, in theory, be recharged about 7 times (advertised as 6 times). If you are sporting an iPad Mini Retina, your battery capacity is rated at a whopping 6471 mAh. This will probably leave you significantly short of a second charge, but for me the main concern is always my phone. 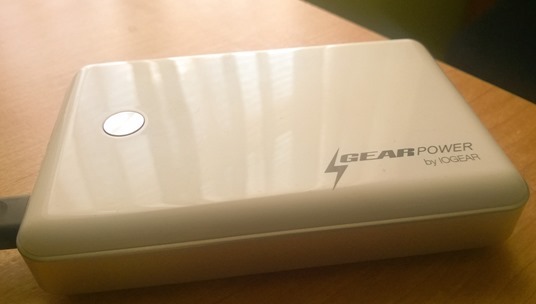 There are other portable power packs with more capacity out there (24,000 mAh and up) but these devices are generally much heavier and would probably be noticeable if you are carrying them around all day. I think the GMP10K is just about the right size, weight, capacity and cost for my needs. Pro Tip: If you are at a tech conference power outlets are always in limited supply, be considerate and bring a power strip, it will make you a popular person very quickly.